OF all the purchases made annually by railway companies, probably the largest individual item, both in value and weight, is that of steel rails. Every year enormous quantities of steel rails must be bought, in order to replace those which have worn out in service and require replacement. British railways themselves “consume” over 200,000 tons of rails annually for replacement purposes alone. 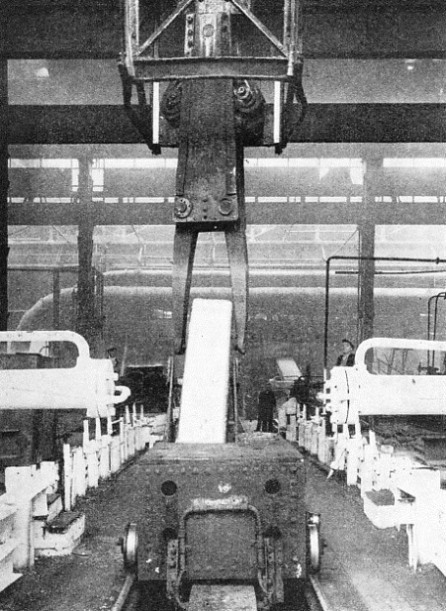 Although these rails are, for the most part, made to standard specifications, special attention is constantly being directed, by variations in the analysis of the steel, by the use of alloys, and by heat treatment, to the production of a rail which will afford a better resistance to abrasion, so that its life in the track may be prolonged. The object of the research is not so much a harder steel, as might be generally supposed, but the combination of hardness with toughness; that is to say, the resilient properties of india-rubber combined with the strength of steel. The rail manufacturer must be continually on his guard against producing a steel that is brittle; brittle steel might cause the rail to fracture when in service, and this in its turn might cause a derailment. In the operation of steelmaking there are three independent stages. The first is the reduction of the ore to metallic iron; the second is the refinement of the iron and its conversion into steel; and the third is the rolling of the steel from the ingot to the finished rail. The first stage is carried out in the blast-furnace; the second in the open-hearth steel furnace or Bessemer converter; and the final stage in the rolling mill. A MODERN BLAST FURNACE. Up the inclined skip-hoist on the left the charge is carried to the top of the furnace. To the left of the furnace itself can be seen the mushroom-headed stoves in which the air-blast is heated. Coiled round the base of the furnace is the large pipe from which the blast is fed to the tuyères or furnace nozzles. The reason why it is customary to group blast-furnaces, steel furnaces, and mills under one self-contained plant is that the change from ore to finished steel can be carried out as one almost continuous process, without loss of heat between stage and stage. This makes for economy in production. 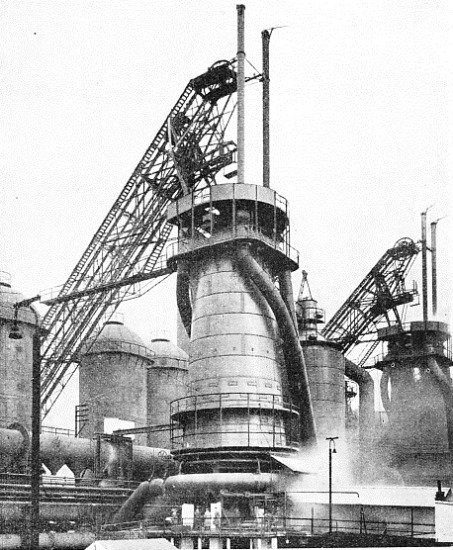 Further, as will presently be explained, the gases generated by the operation of smelting in the blast-furnace can be utilized to raise steam or electric power, so that in these and other respects the modern plant used in iron and steel production, though consisting of independent units, is, nevertheless, interdependent in many important respects. Towering above the plant, and easily its most commanding feature, are the blast-furnaces, usually in groups of not less than three or four together. Each blast-furnace is a great circular column of masonry, about three feet thick, and from eighty to a hundred feet high, cased on the outside with steel plates, and tapering from the bottom to the top. At the top is the “throat”, through which the charge is introduced, and at the bottom is the “hearth”, in which the molten iron accumulates. There are three constituents in the blast-furnace charge. The first, of course, is the iron ore itself; the second is coke for combustion purposes; and the third, in small quantities, is lime-stone. In older blast-furnace plants the charge is taken by lifts in large hand-barrows to a stage running along the top of the furnaces, and there tipped in. In the modern plants, however, the various components are collected from the bunkers by electrical appliances, automatically weighed, dumped into skip-hoists, and carried by power - usually up a long diagonal skipway - to the furnace-top, where they are dropped in, the whole series of operations practically dispensing with manual intervention. Charging is constantly in progress, for the blast-furnace is a non-stop worker. There are records of blast-furnaces having remained in continuous operation for over thirty years; but the more rapid output demanded by modern methods renders such long working periods out of the question, owing to the need for much more frequent renewal of the masonry lining. But during the years that a furnace is “in blast”, the solid charge is being introduced uninterruptedly at the top, and by periodic tapping the two products of smelting - iron and slag - are being withdrawn from the bottom. A third very important by-product - the blast-furnace gas - is led away from the upper part of the furnace by the large pipes that are a prominent feature of the equipment. 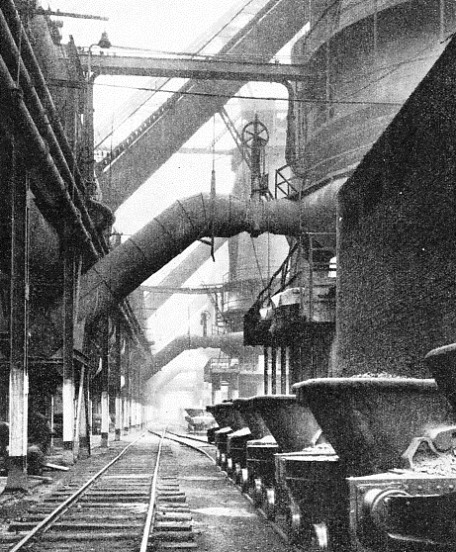 POWER IS SUGGESTED by this photograph of a row of blast-furnaces. The lower diagonal pipes carry the air-blast from the blowers to the tuyères, while the upper pipes lead away valuable blast-furnace gas from the top of the furnace. On the right are tilting slag-ladles. Most important of all is the “blast”, from which the furnace derives its name. This is introduced at the base of the furnace, just above the hearth level, through a series of water-cooled tuyères which project through the masonry lining into the interior. Turbo-blowers supply blast at a pressure of from seven to twenty pounds per square inch. In the earliest blast-furnace plants the blast was unheated air, and what is known as “cold-blast iron” was produced. Modern output conditions require, however, that the blast shall be heated before introduction, in order to speed up the operation of smelting. Grouped round the blast-furnaces, therefore, are seen a series of mushroom-headed steel towers, from two to four to a furnace. Each of these “stoves”, as they are called, is filled with firebrick built up in the form of a honeycomb, and the principle of their use is ingenious. Part of the hot blast-furnace gases is taken from the top of one of the furnaces through a stove, where it is burnt, thus giving out its heat to the honeycomb. Then the gas is turned into another stove, and the cold air from the blowers is carried through the heated stove, extracting its heat before passing into the furnace. Some of the stoves are thus always acquiring heat, while others are giving it out, and the blast-furnace in this way provides its own heat for heating up the air-blast. On entering the furnace the oxygen in the blast is quickly consumed, producing carbon monoxide, which is the principal agent in the reduction of the charge. For those interested in chemical formulae, it may be stated that the reaction which takes place in reducing the iron oxide or ore (Fe2O3) is this: Fe2O3 + 3CO = 3CO2 + 2Fe. As the earthy constituents mixed with the ore would otherwise be infusible, the limestone is added to the charge to provide a “flux” which will combine with them, at the temperature of the furnace, to produce a fusible slag. This slag, being lighter, floats on the top of the metallic iron, which collects in liquid form in the hearth at the bottom of the furnace. From an upper vent the slag is being tapped almost continuously. It is run into great ladles which are usually taken outside the works area to be tipped on to the vast slag-heaps that are a prominent feature of ironworking districts. In these progressive days, however, many uses are found for what was at one time no more than a waste product; among them are railway ballast, “tarmac” or tarred broken slag for road making, and the manufacture of slag concrete and slag bricks. A very large proportion of the blast-furnace slag now produced is not wasted, but is now made to serve these useful purposes. Many years ago, it was customary to allow the gaseous product of the smelting to burn to waste in enormous flares at the top of the furnaces; but no such wasteful procedure is followed to-day, as these gases contain very valuable constituents. In part they are employed, as we have seen, to heat the stoves by which the air-blast is heated before use. A considerable proportion, also, is generally used to fire boilers which produce steam to drive the rolling-mills, or to drive turbo-alternators and gas engines producing electricity for driving the mills and a thousand and one other steelworks accessories. The exhaust steam from the mills is very likely to be led back to drive the turbo-alternators which produce the air-blast for the furnaces. These amazing cycles of operation, designed to prevent the loss of any scrap of developed heat energy which can be put to a useful purpose, are the secret of the efficiency of modern ironworks and steelworks. The charge of the blast-furnace is thus always gradually moving downwards, solid at the top and molten at the bottom. At intervals the vent from the hearth, which is kept closed with a clay plug, is opened, and the accumulated contents of the hearth are run out. If the iron is to be disposed of as iron, it is run into the “pig-bed”, which is an area of sand below the furnace in which channels have been moulded in the shape of a gigantic comb. Here the iron is allowed to cool and solidify, and the combs are later broken into their constituent parts, or “pigs”, and loaded away. But if the iron is to be converted into steel, it is not cooled, for that would involve wasteful loss of heat. It is therefore run in its molten condition into a ladle, and the ladle is rapidly passed - usually by a works locomotive along a railway line - to the steel plant, which is probably closely adjacent. In its present condition the iron is “cast iron”, a brittle and more or less impure product. Steel, on the other hand, is a very pure form of iron with which certain constituents - chiefly carbon and manganese - have been chemically combined to give entirely different physical properties. Steelmaking is essentially a work of purification, and the addition of the required elements in their proper proportions. Minute changes in the percentages of the elements concerned result in very considerable alterations in the quality of the steel, and the process of steel-making must therefore be carried out with the utmost care and precision. In the original process of steel production devised by Henry Bessemer in 1855, refinement of the iron was carried out in a bottle-shaped vessel known as a “converter”. This was placed in a horizontal position to receive the charge and, after a powerful air-blast had been turned on through tuyères at the bottom, was swung up into the vertical position again, so that this air-blast passed right through the charge. Thus all the impurities were burned out in a reaction so violent, with an accompaniment of showers of bursting sparks from the top of the vessel, that this has always been one of the most spectacular of all steelworks operations. Then came the invention of the Siemens-Martin open-hearth steel furnace, by which the vast majority of British steel is produced to-day. This is a completely enclosed chamber, in which the metal lies in a shallow bath. Over the surface of the bath there is passed a constant stream of “producer gas” (consisting largely of carbon monoxide) mixed with air which has been heated, in somewhat the same “regenerative” manner as the air-blast of the blast-furnaces. Refinement of the iron in this way is a much slower process than in the Bessemer converter, as the time occupied in making a “heat” of steel is eight to ten hours, as compared with twenty minutes or so in the Bessemer process. But it is a “slow but sure” procedure; for open-hearth working allows of more accurate control of analysis, since it is possible to sample the charge at any stage of the conversion; whereas there is no such opportunity in Bessemer working. Further, the open-hearth charge may be 60 to 80 tons or more, or up to 200 tons in a tilting furnace, as compared with but 15 to 25 tons in a Bessemer converter. ALMOST HUMAN in its ingenuity is the charger used for inserting the various ingredients of the charge in the open-hearth furnace. The charger has seized a box from a wagon, and one of the furnace doors is being opened for the box to be introduced and its contents dropped into the boiling metal. One important matter must be mentioned at this stage. The bugbear of the steelmaker is phosphorus, for its tendency is to make the steel brittle. Only the class of ore known as “haematite”, which is the purest, is reasonably free from phosphorus. When haematite iron is being converted to steel, an acid reaction takes place in the converter or furnace, and such phosphorus as there was in the original iron remains in the steel, but it is so small a percentage as to be negligible. Steel made from such ores is known as acid steel, and may be either Bessemer acid or open-hearth acid, according to which process is used in the manufacture. But the major proportion of the world’s iron ores are less pure than haematite, and have a fairly high phosphorus content. It was in 1878 that two chemists named Thomas and Gilchrist discovered that this excess phosphorus could be removed by lining the converter with dolomite, or magnesian limestone, which would furnish a “base” for the removal of the phosphorus in the slag. This was the genesis of the “basic” steel working. In this country the majority of steel production is by the basic open-hearth process, that is to say, in Siemens-Martin furnaces with a basic lining, because the raw materials for the charge are more abundant and therefore cheaper than in acid working. A FIERY TORRENT. Ninety tons of molten steel are seen in this remarkable illustration. 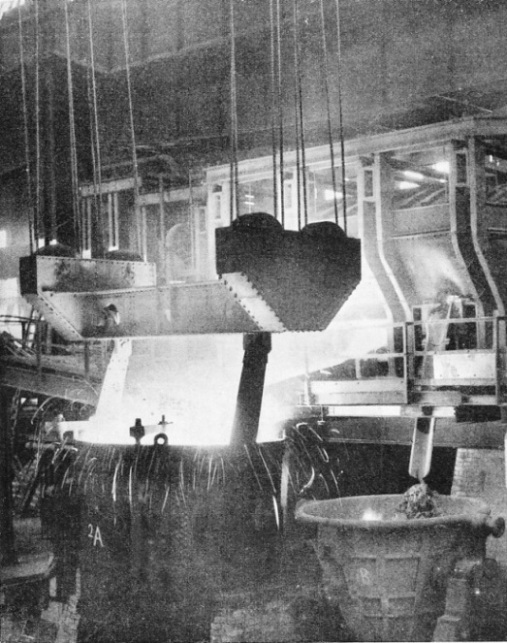 They are being teemed into the immense ladle in the foreground after the steel has been converted from iron in the open-hearth furnace shown in the background. On the Continent rails are made chiefly from basic Bessemer steel, but for certain technical reasons this is not regarded in Great Britain as the equal of basic open-hearth steel. British rails, therefore, apart from a small proportion of Bessemer acid rails, are entirely of basic open-hearth quality. Every rail rolled bears on it lettering indicating the steel process used - “B.A.”, “B.B.”, “O.A.”, or “O.B.”, for Bessemer acid, Bessemer basic, open-hearth acid, or open-hearth basic, as the case may be. Carbon from 0.50 to 0.60 per cent. Silicon from 0.10 to 0.30 per cent. Sulphur not to exceed 0.05 per cent. Phosphorus not to exceed 0.05 per cent. Manganese from 0.90 to 1.20 per cent. Reliance is placed on the carbon for hardness, and on the manganese for toughness, a good internal structure, and a smooth outer skin; silicon helps to purify the metal; but sulphur and phosphorus, which would make for brittleness, must be reduced to a minimum. The remainder of the steel content, of course, is almost entirely iron obtained from the ore.
Steel-making is carried on in a row of furnaces, in the “melting shop”, as it is called. From the blast furnaces iron is brought in its molten condition and poured into an enormous vessel termed a “mixer”. The mixer has a capacity of 400 tons and more; iron from different furnaces is mixed in it to secure a uniform quality. From the mixer the open-hearth furnace receives its charge of molten iron; on the opposite side of the furnace other ingredients are introduced, such as steel scrap, a little iron ore, and so on. The solid part of the charge is inserted by an ingenious electrically-driven charger, which seizes the “boxes” from their wagons, one by one, pushes them into the open furnace door, turns them upside down so that their contents drop into the bath, inverts the box again, withdraws it, and swings. it back on to its wagon - all in a matter of seconds. From time to time the charge is sampled, and the samples are quickly analysed, chiefly by automatic means, at a small laboratory on the melting-shop stage. The interior of the boiling mass has to be inspected from time to time, but it can be looked at only with the protection of blue glasses. Finally, when the refinement is judged to be complete, there comes the moment to tap the charge. By an overhead crane, probably of at least one hundred tons capacity, a gigantic ladle has been brought to the tapping side of the furnace. The plug in the tapping hole is withdrawn, and out pours the stream of molten steel, of almost incredible brilliance into the ladle. During this pouring, there are added to the ladle carefully calculated quantities of ferro-manganese and ferro-silicon, to bring the analysis to the exact percentages of carbon, manganese, and silicon required. Then this vast culinary operation is complete. When the ladle has been filled with anything from 50 to 90 tons of molten steel, it is taken away to a platform under which runs a train of empty ingot-moulds. A stopper on the underside of the ladle is opened, and one by one the moulds are filled with the glowing metal. In these moulds the steel remains no longer than the time necessary to set in solid form, and the ingots are then ready, while still very hot, for the next stage of the operations. CASTING THE INGOTS. The ladle has now been carried by the two strong arms of the overhead crane to the casting-pot, where its contents are being teemed into the ingot-moulds below. On the right is a row of open-hearth furnaces. In preparation for rolling, the ingot is first “stripped” - that is to say, the ingot-mould is removed and the ingot itself exposed to view. The size of the ingot will vary according to the weight and length of rail to be rolled, but it is calculated to a nicety in order to reduce waste metal to a minimum. To get, say, three sixty-feet rails of the ninety-five pounds per yard section requires an ingot weighing about three and a quarter tons. 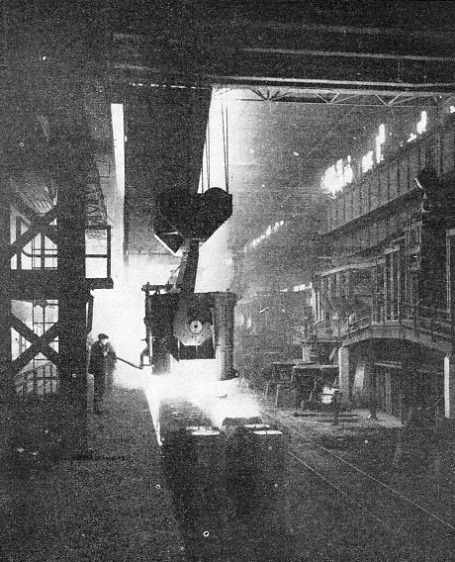 The string of ingots from the “heat” or “cast” of steel that has just been teemed is now brought to the rail-mill, and one by one the ingots are lowered into fiery apertures below the floor-level, known as soaking-pits. Here each ingot “soaks” in heat for a short time, so that it may be at an even heat right through when rolling begins. At the correct moment a huge pair of electrically-operated tongs descends into a soaking-pit and brings out a white-hot ingot. The ingot is dropped neatly into a travelling cradle, which carries it towards a train of rapidly revolving rollers. 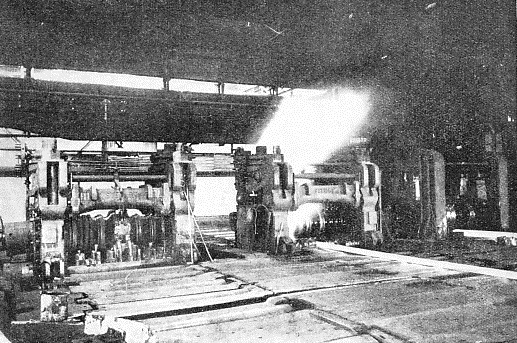 By this it is led quickly into what appears to be a mangle of immense size - a pair of forged steel rolls, mounted in a massive stand, between which the ingot now passes. THE WHITE-HOT INGOT starts a journey. It has just been lifted out of the soaking-pit, where it has been brought to an even heat throughout, and is about to be run to the rolling mill. Because of its heat, the metal is in a plastic condition. As it moves to and fro between the rolls - the whole operation being controlled from overhead platforms - the ingot is gradually lengthening out, and reducing to a smaller cross-section. In the course of some twenty such “passes”, valuable work is being done on the metal, with a corresponding improvement in its structure and quality. Hydraulic shears now neatly cut off both ends of the ingot, with just as much ease as one might slice through a cheese. The amount of “crop” so taken off is very important; it must not be too little, especially from the top of the ingot, which usually contains certain defects; and it must not be too much, or waste would result. Next the lengthy bar of glowing metal - which can retain its heat for a surprisingly long period - runs along a train of live rollers to the roughing and finishing mills. The rolls of these mills have been very carefully turned in enormous lathes with a series of grooves from one side of each pair to the other. Ingenious hydraulic or electric appliances seize the long bar, and work it to and fro through each pair of grooves in succession. In the roughing rolls a rough impression of the section is rolled into the bar, and in the finishing rolls the operation is completed. The precision with which the section is arrived at in these conditions is little short of amazing. Short pieces of rail are cut off, quickly cooled, and tested with templates; and it will be found that the section of the finished rail all round is within one sixty-fourth of an inch of what is required. What was the ingot now resembles a red-hot snake, nearly two hundred feet in length. Live rollers carry it along to the “hot-saw”, where the rough front end is sawn off, with a rasping burr and a shower of sparks, in a matter of seconds. A stopper has then been set at the correct distance from the saw, and up to this the rail is run for the second cut; and so on until the three rails have been cut, and the two ends removed. Owing to the heat, which at this final stage is about 950 to 1,000 degrees centigrade, allowance has to be made for contraction, and the rails are, therefore, cut from seven to nine inches longer than their finished length. Nowadays care is taken of the cooling out by passing the rails through a “Sandberg oven”, which evens out the cooling in much the same way as the soaking-pits evened out the heating of the rail before rolling. In this way stresses in the rail, due to cooling, which might later prove dangerous, are relieved, and further improvement of the product results. When they are down to a black heat the rails are run on to the “hot bank” for final cooling out. 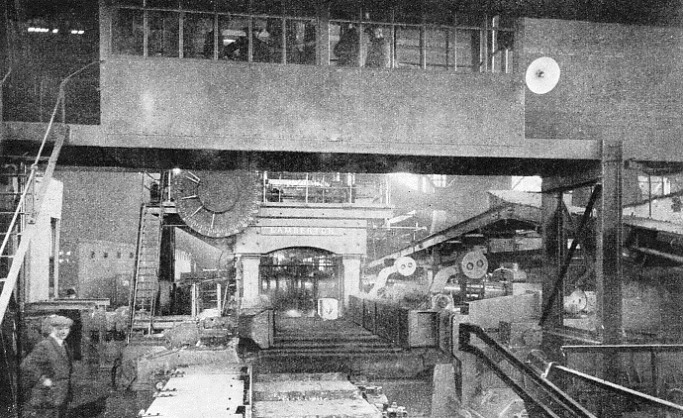 ROLLING THE INGOT begins in the cogging mill, controlled from the overhead platform in the foreground. The dial on the left-hand side of the mill shows the exact cross-section to which the ingot - seen about to pass through the right-hand opening between the rolls - has been reduced. When cool each rail is passed to the straighteners, who, by the use of machines which can exert a heavy local pressure, take the kinks and bends out of the rail and leave it perfectly straight. Next it is transferred to the ending machines, which grind both ends to a smooth surface, and to an exact length; the latter is not allowed to vary by more than three-sixteenths of an inch, either above or below the correct length. Drills then drill at both ends of the rail the holes for the fish-bolts. Now comes the important stage of inspection. For this purpose the rails are passed out on to the inspection banks. Here they are laid out in neat rows, from 100 to 300 at a time, head upwards and touching, looking like a solid floor of steel of the beautiful blue-grey colour that is seen only just after rolling. For the purpose of inspection a representative of the railway company is present at the works, as it is vital that all rails delivered shall, as far as is humanly possible to ensure it, be free from defects. But first the inspector will have witnessed the prescribed tests. 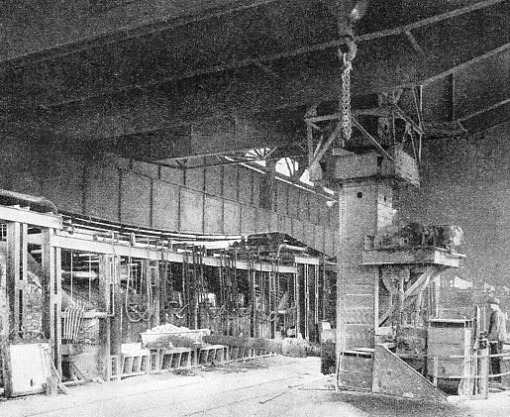 From every heat or cast of steel, whether made in a Bessemer converter or open-hearth furnace, a 5 ft length of rail is taken and laid head up on two supports, 3 ft 6 in apart, beneath a tall appliance that has the appearance of a pile-driver. Up a graduated scale a steel “tup” weighing one ton is next hoisted. This is dropped on to the rail, first from a height of 7 ft (if the rail is of the 95 lb section) and then from 20 ft. The result is that the rail deflects, and the deflection at the centre must not exceed 4 in. Still less must the piece break as the result of the impact, for that would indicate brittleness, against which the falling weight test is the chief safeguard. Once in every 100 tons a tensile test is also taken. For this purpose a piece of steel is cut from the railhead and very carefully shaped in a lathe to a diameter of 0.564 in, which gives a cross-sectional area of one-quarter of a square inch. This test-length is then pulled apart in a hydraulic testing machine, usually of 100 tons capacity, and must show a breaking strength of not less than 46 tons per square inch. Further, before breaking, the test-piece must “extend”, to show its ductility; and this extension, measured on a gauge length of 2 in, must not be less than 12 per cent. But such is the quality of modern rail-steel that 53 or 54 tons per square inch with 15 to 17 per cent extension are common figures. It may be added that every rail has impressed on the end a number showing from which particular cast it has been cut. On the “web”, or middle portion of the rail, also, there is rolled, in raised lettering, the “brand” which shows the name of the manufacturers, the steel process, the section, and the month and year of manufacture. THE FINAL STAGE of rolling takes place in the finishing mill through which the rail, still at a temperature of nearly 1,000 degrees centigrade, is here seen passing. In the background are the roughing rolls, where a rough impression of the section is being rolled into the bar. When the railway company’s inspector has satisfied himself that the tests are in order, there follows the detailed inspection of the rails. Every rail is measured for length, and turned over in such a way as successively to expose to view both sides and the foot, so that any rails with surface defects may be marked out. During this procedure the inspector and the works representatives walk up and down examining the length of the rails. The heads of the rails are then similarly “walked”. Templates are applied to the section of the rail and the drilling; the rail-ends are closely inspected to ensure that there are no top-end ingot defects present, such as a crack in the centre of the web, known as “piping”; the rails are carefully examined for straightness and the inspection is complete. The final operation is for the steel die or stamp of the railway company’s inspector to be impressed on the ends of all the rails that have been accepted, and all is now in readiness for delivery. At most rail rolling-mills the banks are spanned by cranes which pick up their loads by magnetism. Great magnets are lowered on to the rails, and on the application of the current they will pick up anything from half-a-dozen to fifteen or sixteen 60 ft rails off the tier and deposit them on the wagons which are to deliver them to the purchaser. Much manual handling of earlier days has been avoided in this modern fashion of lifting rails. Such is the size of a modern ironworks and steelworks plant that it has to maintain a railway system of considerable size on its own premises, sometimes equipped with signal-boxes and signals. One such works in the Middlesbrough area maintains over eighty locomotives. 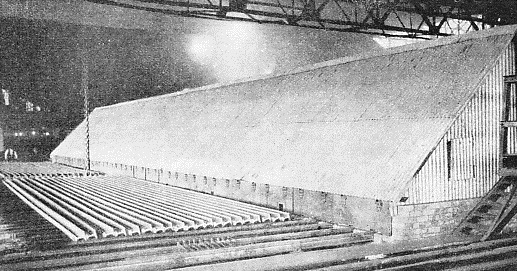 THE COOLING BANK. To the right is the oven, in which the cooling of the rails is retarded so that the rail may cool evenly through a certain critical range of temperature. If the rails were allowed to cool too quickly undesirable stresses might develop in the metal, and impair its efficiency. It is largely due to the many precautions and the continued research which is carried on in steelworks that all possibility of accidents caused by flaws in rails has been practically eliminated. And nobody who has inspected the process of modern rail manufacture can have failed to have been impressed by the thoroughness of the modern methods, employed in this vital side of railway industry. Steel rails can be classed into two types - the bull-headed and the flat-bottomed. The bull-headed type are supported by cast-iron chairs, while the flat-bottomed type are carried on cast-iron or steel sole-plates and fixed direct on to the sleepers by screws or spikes. Rails when laid on the track almost invariably have an inward cant of something like 1 in 20, and the wheel treads of the trains are coned accordingly when new. Nowadays, railway companies prefer to use longer rails than previously, but the average rail length is about 60 ft. Germany, however, differs; in that country the standard rail length is 30 metres, that is 98 ft 5 in. You can read more on “The Permanent Way” and “Switches and Crossings” on this website.